UK headline consumer price inflation has jumped from 2.5% to 2.7% in August. This is the fastest pace of inflation since February and is a fair bit above the 2.4% market consensus. To highlight the surprise of this report, not a single economist out of 36 surveyed by Bloomberg predicted it would come in this high. 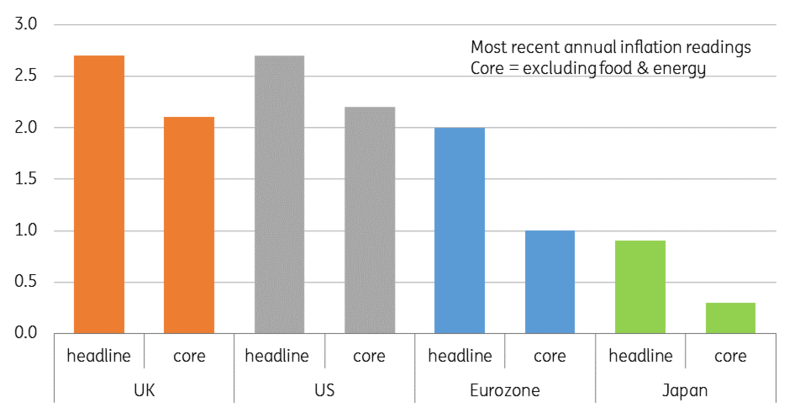 The core rate, which excludes food and energy components saw a similar miss. The annual rate rose to 2.1% from 1.9% rather than drop to 1.8% as predicted. The details show the main upside appears to come from the clothing and footwear component and recreation. After a period of intense deflation, prices jumped 3.1% month on month, lifting the annual rate of clothing price inflation to +0.3% from -0.4%. Transport prices also rose to 6.1% YoY from 5.7% (led by transport fares rather than energy) while recreation saw its annual inflation rate rise to 3.6% from 3.1% (led by theatre price hikes apparently). There were also moves higher in health, food and alcohol. Marginal declines were seen in miscellaneous, household and communication prices. As such there are some fairly broad-based price moves, which appears to have caught everyone by surprise. Certainly, there has been some better activity data, but it is unlikely that UK corporates have finally got significant pricing power. Sterling had a bad run June - August so there could be some currency pass through into prices, but we have since seen a significant reversal in its fortunes with EURGBP back at 0.88 after having nearly touched 0.91. If today’s inflation rise is due to currency, the momentum should fade. Instead, we think it is largely noise with inflation set to return to the 2% target early next year. Either way, the economy continues to underperform key partners, and inflation remains broadly in line with the Bank of England’s target. Given the twists and turns of the Brexit negotiations, we continue to think the BoE will wait until after the UK formally leaves the EU in March next year before seriously considering raising interest rates again. This suggests May is the most likely point for the next 25bp move.